near Tunganath (~3400m), Uttarakhand on 6 July 09. 371. Tribura thoracica. 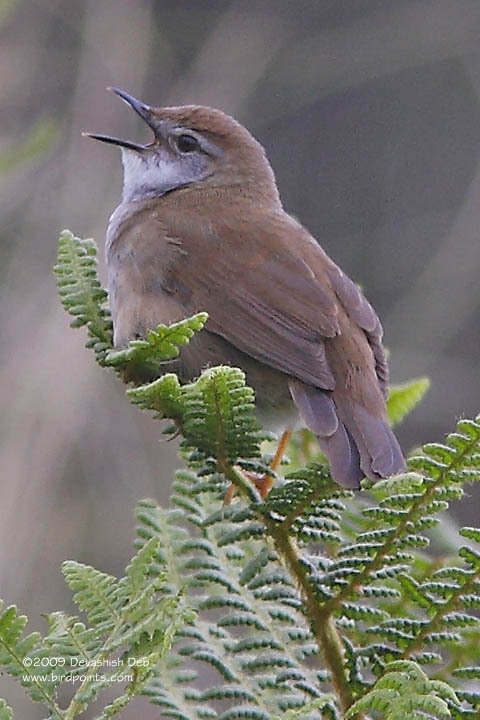 The Spotted Bush-Warbler. Salicaria affinis, Hodgs. in Grays Zool. Misc. p. 82 (1844, descr. nulla); id. Cat. Mamm. &c. Nepal, pp. 64, 151 (1846). Dumeticola thoracica, Blyth, J. A. S. B. xiv, p. 584 (1845); id. Cat. p. 183. Horornis flaviventris, Hodgs. P. Z. S. 1845, p. 31; Jerd. B. I. ii, p. 162; Brooks, S. F. x, p. 170. Dumeticola affinis (Hodgs. ), Horsf. & M. Cat. i, p. 334; Jerd. B. I. ii, p. 158; Godw.-Aust. J. A. S. B. xli, pt. ii, p. 142; Brooks, J. A. S. B. xliii, pt. ii, p. 246; id. S. F. iii, p. 286. Dumeticola brunneipectus, Blyth, Ibis, 1867, p. 19; Blanf. J. A. S. B. xli, pt. ii, p. 164; Hume, S. F. i, p. 494; id. N. & E. p. 328; Brooks, J. A. S. B. xliii, pt. ii, p. 246; id. S. F. viii, p. 475. Schcenicola affinis (Hodgs. ), Hume, Cat no. 519; id. S. F. xi, p. 205. Schoenicola brunneipectus (Blyth). Hume, Cat. no. 519 bis. Schcenicola flaviventris (Hodgs. ), Hume, Cat. no. 524. Lusciniola thoracica (Blyth), Seebohm, Cat. B. M. v, p. 124, pi. vi. Lusciniola flaviventris (Hodgs.) Seebohm, Cat. B. M. v, p. 131. Tribura thoracica (Blyth), Oates in Humes N.&E. 2nd ed. i, p. 229. 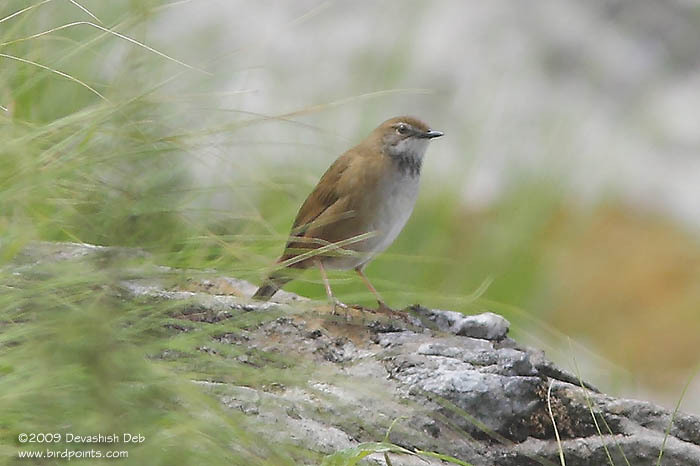 The Spotted Reed-Warbler; the Yellow-bellied Hill-Warbler, Jerd. Coloration. In summer the whole upper plumage, wings, and tail are rufescent olive-brown; lores and a rather distinct supercilium ashy white; sides of the head and neck ashy brown; chin and abdomen pure white; throat ashy brown, with numerous black spots; breast ashy; sides of body, vent, and under tail-coverts dull rufous-brown, the last broadly tipped with dull white. The sexes appear to be alike, judging from the specimens I have examined. In winter a good deal of the ashy brown on the sides of the head and neck and on the throat and breast becomes ochraceous, and the spots on the throat are reduced in size and number. The young bird has the chin, throat, and abdomen dull yellow with a greenish tinge and the remainder of the lower plumage is dull ochracous brown; there are a few brown mottlings or irregular bars on the throat, and in this plumage the birds are Horornis flaviventris, corresponding exactly with Hodgsons types. In winter the bill is brown; legs pale fleshy; iris hazel (Cockburn); in summer the bill is deep black. Length about 5; tail 2.5; wing 2.1; tarsus 0.75; bill from gape 0.6. Distribution. Nepal and Sikhim, extending to the Bhutan Doars and across the valley to Shillong. Godwin-Austen also records this species from the Megna river in Sylhet. In the British Museum there are specimens collected in the N.W. Himalayas by Pinwill, and in Kashmir by Jerdon. Habits, &c. This species appears to be resident wherever it is found, or to migrate very locally. It occurs up to 9000 feet of elevation. Its nest has been found in Nepal and Sikhim, a cup loosely made of dry leaves and grass, and built in a low bush. The eggs, three or four in number, are white with purplish-red spots and specks, and measure 0.68 by 0.55. The breeding-season appears to be June and July.